Work led by COMET scientists Juliet Biggs and Andy Hooper is developing new methods for using artificial intelligence and satellite data monitor and potentially help predict volcanic eruptions. Their work is described in a Nature article, published on 7 March 2019, which outlines how Juliet’s team at Bristol is using satellite imagery from the European Space Agency Sentinel-1 mission, alongside machine learning, to spot the formation of ground distortions around volcanoes. Meanwhile at Leeds, Andy’s team is using a technique that searches for changes in the satellite data. Where the ground around a volcano is deforming, their method can flag if the distortion speeds up, slows down, or changes in some other way, allowing researchers to detect even small ground alterations. 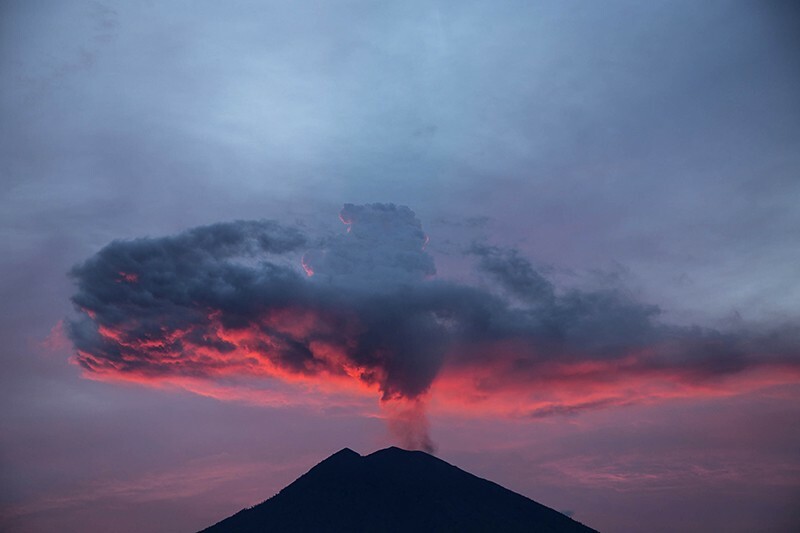 The full article by Alexandra Witze, available to read in Nature, is How AI and satellites could help predict volcanic eruptions. As part of the RiftVolc consortium, COMET researchers David Pyle, Tamsin Mather and Juliet Biggs have co-authored a new paper on geothermal monitoring and volcanic hazard at Aluto volcano in the Ethiopian Rift Valley. They explain more in their Conversation article How to turn a volcano into a power station – with a little help from satellites. COMET researchers at the University of Oxford have estimated the total carbon emissions emanating from the Eastern Rift – the eastern branch of the East African Rift, a zone near the horn of East Africa where the crust stretches and splits. The new study published in Geochemistry, Geophysics, Geosystems, led by COMET PhD student Jonathan Hunt, working alongside Tamsin Mather and David Pyle as well as colleagues from Oxford and Addis Ababa University, Ethiopia, extrapolates from soil carbon dioxide surveys to estimate that the Eastern Rift emits somewhere between 3.9 and 32.7 million metric tons (Mt) of carbon dioxide each year. The research demonstrates how, even near some seemingly inactive volcanoes, carbon dioxide from melted rock seeps out through cracks in the surrounding crust. You can read more about the study on the Deep Carbon Observatory website. Congratulations to COMET scientist Professor Andy Hooper, who has been awarded the American Geophysical Union (AGU) James B. Macelwane Medal in recognition of his contributions to the geophysical sciences. Established in 1961, the medal is given to outstanding early career scientists who have shown depth, breadth, impact, creativity and novelty in their research. Professor Hooper, who is also Co-Director of the Institute of Geophysics and Tectonics at University of Leeds, pioneered the development of new software (StaMPS) to extract ground displacements from time series of synthetic aperture radar (SAR) acquisitions. StaMPS is now used widely across the Earth Observation community. He also discovered a new link between ice cap retreat and volcanism via geodetic monitoring from space and subsequent modelling of the 2010 Icelandic volcanic eruptions, and played a significant role in the €6m FUTUREVOLC project, leading the long-term deformation effort to integrate space and ground based observations for improved monitoring and evaluation of volcanic hazards. Alongside other COMET researchers, he was part of a team contributing to the international scientific response to the earthquake which devastated Nepal in April 2015. Most recently, working with colleagues from Iceland, he has shed new light on how volcanoes collapse during major eruptions, focusing on the 2014-15 eruption at Bárdarbunga. Professor Hooper will be presented with the award at the 2016 AGU Fall Meeting, where he will also be giving a talk at the Union Session focusing on the new generation of scientists, where he will also be conferred an AGU fellow. Congratulations Andy from all your colleagues at COMET. A new paper published in Geophysical Research Letters by Tom Pering and Andrew McGonigle has combined fluid dynamical modelling of gas flow in conduits with high time resolution measurements of volcanic gas discharge for the first time, revealing new insights into the dynamics of Stromboli volcano. Their work is based on a recently developed approach using ultraviolet cameras which enable measurements of volcanic gas emission rates with unprecedented time resolution – around 1 Hz – such that gas release patterns associated with rapid explosive and non-explosive basaltic processes, can be resolved for the first time. Data were captured on Stromboli, where an intriguing coda of lifetime on the order of 10s of seconds was identified following each explosion. Computational models were also developed to simulate the upward flow of conduit filling, so called “Taylor bubbles”, which are believed to be responsible for explosions on Stromboli when they burst at the surface. The numerical models reveal the fissioning of smaller bubbles from the Taylor bubble bases to generate a train of “daughter bubbles”, thought to be responsible for generating the post-explosive coda upon arrival at the surface. This process could play a primary yet hitherto unconsidered role in driving the dynamics of strombolian volcanism, both on Stromboli and other targets worldwide, with significant implications for the magnitude of resulting eruptions. Combining models with field observations in this way shows considerable promise for improving our understanding of how gases drive volcanic activity. Over what distances do volcanoes interact? In the geological past, large eruptions have often occurred simultaneously at nearby volcanoes. Now, a team of COMET scientists from the University of Bristol uses satellite imagery to investigate the distances over which restless magmatic plumbing systems interact. In a study published in the journal Nature Geoscience, the scientists use deformation maps from the Kenyan Rift to monitor pressure changes in a sequence of small magma lenses beneath a single volcano. Importantly, they find that active magma systems were not disturbed beneath neighboring volcanoes less than 15 km away. The lead author, Dr Juliet Biggs, explained: “Our satellite data shows that unrest in Kenya was restricted to an individual system. Inter-bedded ash layers at these same volcanoes, however, tell us that they have erupted synchronously in the geological past. This was our first hint to compare observations of lateral interactions based on recent geophysical measurements with those from petrological analyses of much older eruptions. The team, which includes a recently graduated PhD student Elspeth Robertson and Bristol’s Head of Volcanology Prof. Kathy Cashman, took this opportunity to compare observations from around the world with simple scaling laws based on potential interaction mechanisms. They found that stress changes from very large eruptions could influence volcanoes over distances of up to 50 km, but that smaller pressure changes associated with unrest require a different mechanism to explain the interactions. The study was funded by two major NERC projects: COMET, a world-leading research centre focusing on tectonic and volcanic processes using Earth observation techniques; and RiftVolc, which is studying the past, present and future behavior of volcanoes in the East African Rift. The research paper, The lateral extent of volcanic interactions during unrest and eruption, was published online in Nature Geoscience on 15th February 2016. Pablo Gonzalez’s work on the 2014 Pico do Fogo eruption has been featured in the AGU’s Eos magazine. The research uses a new satellite imaging system to model the subsurface path of the magma that fed the eruption, and shows that Sentinel-1’s TOPS InSAR technique has the potential to be used to study other natural hazards, including earthquakes and landslides.